After months exploring the incredible outdoor elements of South America – the Andes, massive glaciers, incredible lakes, penguins and guanacos – last weekend we made our trip up to Iguazu Falls, in the jungle between Argentina, Brazil and Paraguay. Meaning ‘great waters’ in the native Guarani language, we find this superlative no where near strong enough to do these immense falls justice. 275 waterfalls stretch for almost 3 kilometers (1.7 miles straight) along the Iguazu River, which creates the border of Argentina and Brazil. Every single second 1.3 million liters of water flow over the 64m (210ft) falls. In the five hours of our first day visit, that means over 28.4 BILLION liters of water went over the falls, and it does so with such an unearthly force that makes Iguazu one of the new seven natural wonders of the world. 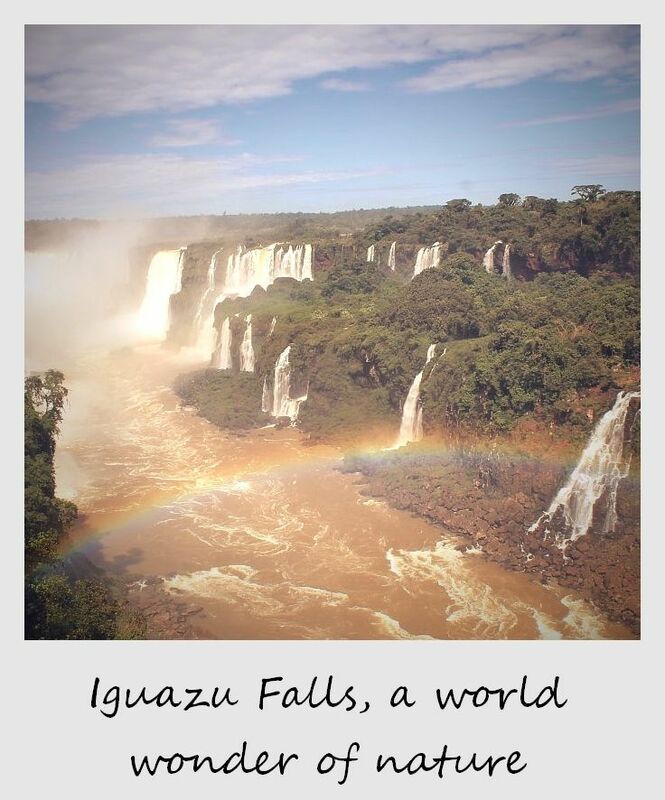 Seeing the Iguazu Falls was one of the few moments during our travels where our high and overly enthusiastic expectations were actually exceeded. In total we spent two days exploring the Falls and will write about in more detail soon. What we will tell you is that the highlight was taking a speed boat ride directly into two different sections of the falls, including the ‘Devil’s Throat’ (Garganta del Diablo), the biggest and highest part of the waterfalls with a height of 80meters and a width of 150meters. Although we may have been wondering whether picking up cheaper travel insurance may have been a smart idea, the feeling of exhilaration won out over the very real understanding that these massive waterfalls could have killed us in literally one second (1.3million liters) flat. Amazing waterfalls, one of its kind. Its amazing that a rainbow is visible. What an incredible sight. It looks almost alien. It was unbelievable, Charli! These waterfalls are just magnificent! Pictures can’t even express how mighty they feel with the roaring sound of the water! Absolutely breathtaking!! And with a rainbow!!! For six years my husband and I have been traveling full-time by sailboat and RV, and we haven’t seen anything close to that yet!! The closest we’ve come is the Agua Azul waterfalls in Chiapas Mexico (http://roadslesstraveled.us/agua-azul-mexico/). Lovely, but not close!! South America just bumped way up on my bucket list. Thanks for sharing!! Emily – it’s definitely one of the most remarkable things we’ve seen anywhere in the world! We actually went to Agua Azul two years ago and even though their size doesn’t come anywhere close to Iguazu Falls, they are some of the most beautiful waterfalls we’ve visited! What I Wonder When I Wander: Can you ever really go back?